As library staff begin to work with the newly targeted community, it is beneficial to create a plan which is multiphased – so community input and involvement can continuously have impacts. 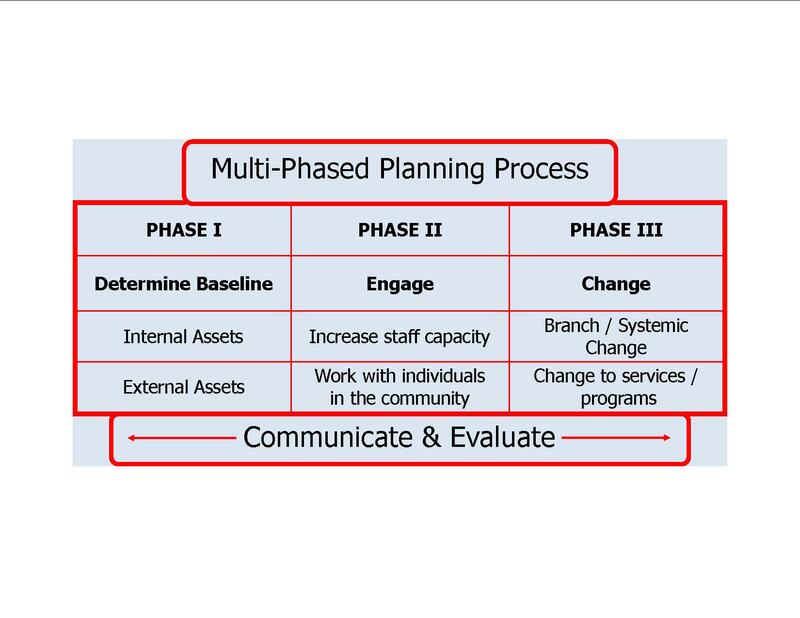 Predetermined outputs, outcomes, and impacts, which are based on library management perceptions at the beginning of a service planning process – implies library led, not community led. While service providers have provided a glimpse of the individual life circumstances of the targeted group – only by directly engaging (not solely observing) and developing relationships with individuals, will library staff be able to start hearing about community needs. Since this process moves service development from an internal process, to both an internal and external process – it is important to clearly communicate both internally and externally. Make sure others are kept in ‘the know’. It is important to explain the implications of what you are hearing from your target group to internal and external stakeholders. The advantage of constantly communicating with community members, is it also provides an opportunity to evaluate. Librarians in a World of Austerity: What is Our Role? Austerity is kicking in across Europe and may be coming to a community near you soon. And in response to the last fact, I recently read a newspaper article based out rural Manitoba (where I grew up) which literally scared the cr@p out of me. Why you may ask yourself? Well feel free to give it a read. Although this is just a letter to the editor, this should really send off some alarm bells. There are people who are raising similar justifications for the current economic conditions in the United States, England, and I would presume – we will soon be hearing voices like this attacking the diverse people of Canada. I think of youth in my home town who may read a piece of information like this and the impact the information can have on their belief system. I remember how much of a sponge I was as a youth, and without someone else providing alternative narratives through other sources of information, this could have formed the ‘truths’ for myself and many other youth as they develop into adulthood. As providers of information how should librarians [yes both those socially conscious and other librarians] respond? So librarians, are we non-biased providers of information? Do we passively respond by providing the general public with access to ‘well balanced’ information sources? Are we agents of social change? Are there certain social truths and absolutes which librarians are willing to take a stand for? I personally think that avoiding issues and not taking a stance (complicit as it is) is also a stance.